What will your phone be like in 20 years? If you look back 20 years in terms of phones, you're going back to the likes of the Nokia 8110, and that should tell you all you need to know about the rapid pace at which we're going - so will the jump be just as big, or even bigger, over the next two decades? That Nokia 8110 phone had a monochrome LCD display, and, with no touchscreen, had a keypad for a keyboard. It may have been featured in one of the scenes in The Matrix but it couldn't do much more than send and receive phone calls and text messages. Could the phones of 2036 be as far ahead of the iPhone 7 as the iPhone 7 is from the Nokia 8110? We've spent some time gazing into the T3 crystal ball and these are the the changes we expect to see when we're unwrapping a brand new handset some 20 years from now. Battery life remains the biggest bugbear among phone users. With our phones becoming more powerful and boasting better displays, it's understandable that the batteries have always struggled to keep up. The good news is that better battery technology is coming, from nanobatteries (featuring tiny tower structures that are hundreds of times smaller than the bits in current power packs) to improved, more efficient materials (like lithium metal foil). It's not inconceivable that in 20 years time we might be talking about topping up while the kettle boils rather than leaving phones plugged in overnight. Wireless charging should also become standard too, so that any surface is a charger. Want something even more out-there? How about a phone battery that's powered by water? Hydrogen fuel cells, first proposed by Samsung back in 2008, use the reaction between water and a metal element in the phone to produce hydrogen gas, which then powers the cell. We're still waiting for a Samsung-Evian tie-in, though. We've now got used to phones with curved edges on their displays, and you can expect this technology to improve substantially over the next two decades. Will we see a phone you can fold up and put in your pocket by 2036? It's hard to say, but it's almost certain that the display technology will be ready - it's just a question of whether phone manufacturers can get all the other bits and pieces to flex too. There's going to be plenty more happening in the field of phone displays over the next few years too: think screens powered by solar energy, or holographic displays that can project an image a few centimetres above your phone (which might make your favourite endless runner that bit easier to play). We're also going to see screens become more intelligent and more responsive, screens that can mimic paper or other kinds of textures. Devices like the Apple Watch already have basic haptic feedback, and so in 20 years time it's going to be much more advanced - imagine the kind of tactile response you might get from games and apps. Back in the day, we dreamed about home consoles beating arcade-machine graphics. Then it was all about seeing how long it would take PCs to flatten console graphics. Now we're in the big race to see how long it'll take phones to outdo the consoles. Given its prowess in the graphics- card space, it's no surprise that Nvidia is pushing forward to make the mobile phone a real rival for your console, with the brand confirming to us that the tech is advancing at a rate of knots. Every year the graphics capabilities of our smartphones get better, and the devices of 2036 should easily outpace the PlayStation 4s of today. Quite how advanced our home consoles will have become by then remains to be seen, but based on the pace of change over the last 5-10 years we'd say there's a lot to look forward to. Let's not forget virtual reality, already around on smartphones in limited form. Better graphics and better screens will mean better virtual worlds and maybe wearable headsets that are barely noticeable. 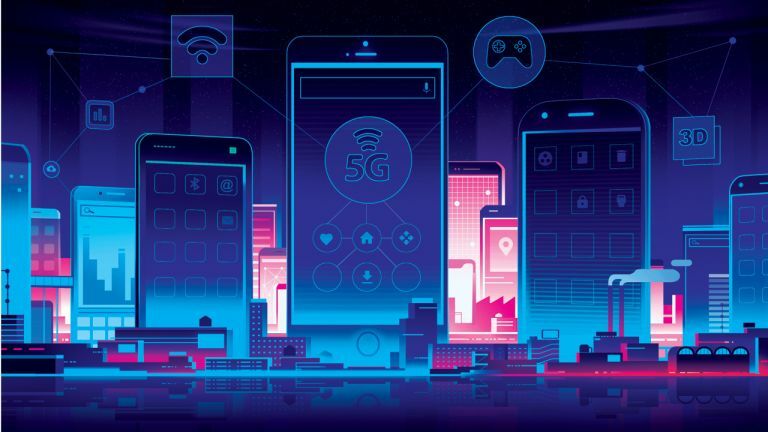 Most of us are just getting to grips with 4G, but 5G is already revving its engine. You probably won't get to taste its goodies until around 2020, but they're set to revolutionise the way we use phones, offering speeds up to 70 times faster than what's currently available. Want a movie in three seconds? Done. Fancy that Spotify album but not sure if you've got time to download it? It's already happened in the time it took to read that sentence. Not only is that mind-bendingly fast, it's about ten times quicker than your old computer hard drive could even save stuff. Streaming console-grade games to your phone will no longer have that annoying lag, so remotely playing console games on the bus will finally be a reality. And as long as the servers and websites on the other end are quick enough, browsing the web and watching streamed videos will be just as quick as looking at content stored on your phone. It's hard to overemphasise what a difference a super-fast, ubiquitous mobile network could make - imagine having high-speed Wi-Fi all the time, wherever you go. By 2036, you won't have to imagine. The likes of Cortana, Siri and Google Assistant already play big roles on the phones of today but it's nothing compared to the influence they'll have in 20 years time. This really is where the innovation is going to happen over the next couple of decades, as these assistant apps become smarter and learn more and more about us. The traditional rows and columns of apps will go away to be replaced by a simplified interface that shows us what we want to see before we know we want to see it. Siri and its rivals will be almost indistinguishable from the friends and family you talk to via your phone, and if you've seen the movie Her then you know how that might turn out. It may sound scary but it should be hugely useful. The whole concept of the phone might go away as we use small microphones and earpieces to communicate with the cloud instead, though there's still likely to be a screen of some kind, even if it is an optional, foldable one - otherwise how else are you going to battle through the Star Wars Episode XVIII spin-off game? Looking for a great read on the latest gadgets and tech? T3 magazine has it all - click here to subscribe now.